Weekly Forum: Should the AG Prosecute Clapper, Comey and Brennan? Every Monday, the WoW! community and our invited guests weigh in at the Watcher’s Forum, short takes on a major issue of the day, the culture, or daily living. This week’s question: Should The AG Prosecute Clapper, Comey and Brenner? Patrick O’Hannigan:Yes! Rule of law should mean something, and even from what is public knowledge, those bureaucrats have quite obviously violated the public trust. That they justify their arrogance in bureaucratese or weasel-speak publicly (and more crassly in private, you can be certain) does not excuse it. Similarly, “prosecution fatigue” brought on by selective journalism about Robert Mueller’s never-ending fishing expedition ought not shield Clinton cronies,Obama sycophants, and “deep state” operatives (but I repeat myself). Rob Miller: Now, let’s not get carried away here, shall we? After all, all they did was to leak classified material to their Democrat pals in the media, lie to congress about it under oath and use a fake dossier paid for by the Clintons to get a FISA warrant issued under false pretenses to spy on the opposing campaign during an election year. And oh, I almost forget, conspire to let Mrs. Clinton off the hook for numerous felonies committed while she was Secretary of State. Now everybody makes mistakes, after all. So why ruin these distinguished Obama lackey’s umm, public servant’s lives? Actually, the real culprit here is someone I genuinely used to like and respect, Attorney General Jeff Sessions. Along with leaving swine like Comey, McCabe and the rest of the gang in charge after he took over, Jeff Sessions was one of Trump’s biggest beginner’s mistakes. What was needed in the current climate was the president’s own version of Eric Holder,someone who would support him every step of the way and laugh in the faces of his critics in congress and the media. Instead, he picked someone who recused himself for no reason at all from the fake Russia probe, and who pretty much was asleep until very recently. Trump would have been far better off leaving him in the Senate and picking someone like Rudy Giuliani or maybe even Tom Fitten or Trey Gowdy. So to answer the question, yeah, these creeps ought to be prosecuted and jailed. 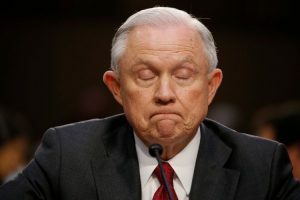 And Jeff Sessions ought to get the boot if he doesn’t start waking up and and doing what he was appointed to do. Heck, fire him anyway. Just because. Laura Rambeau Lee:By now it should be obvious that Comey, Clapper, Brennan, and so many others conspired with the Democrat Party and the Hillary Clinton campaign to make sure Hillary won the 2016 presidential election. They were certain she would win and in doing so would favor those who helped her politically, so they were eager and willing to be a part of this inner circle. A Clinton win also would assure none of their illegal activities would be discovered. Trump’s win exposed their activities, so they turned their focus on destroying Trump by falsely asserting the Trump campaign had colluded with Russia to win the election. We have spent the last year and a half wasting time and money on a witch hunt. There was never any collusion between the Trump campaign and Russia. What these purely political actors committed was treason against our country. At times like this I like to think what the Founding Fathers would do. I believe they would all be tried, convicted of treason, and summarily executed. Yes the Attorney General should prosecute these three, along with the other major and minor players who aided them either actively or by not disclosing what they were doing. No one should be above the law. The actions of these people were so egregious they must be punished and made an example of. We are not a country if we do not apply the rule of law to every individual equally. Treason should be punished with death. ← Weekly Forum: Is It Time To Forget About The Holocaust?